Jeremus is a surgeon from overseas and the companion with the highest initial medical skills. He is tied with Rolf for the highest starting Intelligence of all the companions, and also starts with some skill in Trade. His starting stats and low Agility make him a poor candidate for the use of either a ranged weapon or a shield, so he should stick with polearms and two-handed weapons. Likewise, he is best left unmounted. He isn't bad at fighting, and it's good to invest in his Strength, Ironflesh and Power Strike, but his medical skills are too critical to risk getting lost from him getting knocked out so you should have him at the bottom of your troops list. It's important to increase his Intelligence so you can further develop his medical skills. While surgery is his primary focus, as shown by feats such as saving the life of the lord of Almerra Castle, it's important to keep all his medical skills high unless another companion is handling them. He isn't noble so you probably won't want to bother with his Charisma. 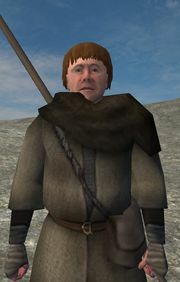 Jeremus starts with a Pilgrim Disguise, Nomad Boots, and a Staff. In Warband, he can be sent on a mission to Praven to determine the state of affairs in the Kingdom of Swadia. Sending him out to spread word of your claim will upset Nizar and support the argument that you are the rightful heir to the throne of Calradia when attempting to persuade lords to join you. This page was last edited on 24 June 2011, at 10:49.